Are they not cute together? Nothing like a boy and his dog. Too bad it is too hot for them to enjoy the outside together today. Here are more pictures of my lazy dogs. Princess has been laying on cool surfaces the last few days. The heat and humidity really get to the old girl. But she still has pep when she wants to. Coco just decided to go to bed(as usual)with MAtthew. You see she had to bring her toy though. I swear between Matthew and Coco and their toys there is barely room in the bed for me..lol! 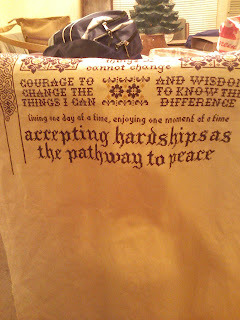 I hope to have a new pic of the serenity prayer soon. Off to stitch now. I got a new camera tonight so I took a few photos to try it out. There is a picture of Princess the cocker spaniel, Coco the beagle and Matthew sleeping with stuffed dog. This is not the best picture because I can not find my camera but wanted to get an undated photo. I took this one with my phone but you get the idea.